Michael Kelly, the boss of the backer and developer of the Ho Tram Strip, a beachside Vietnam casino resort and real estate project, will serve as the national chair for the American Chamber of Commerce (AmCham) in Vietnam this year, reported media outlet VietnamNet. 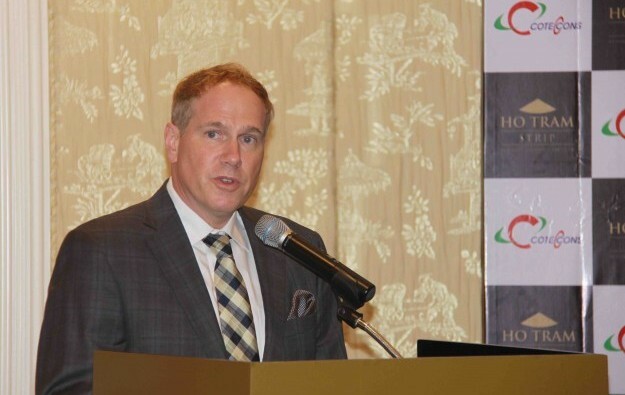 Mr Kelly (pictured) has in addition been elected chair for AmCham Hanoi, the chapter based in Vietnam’s capital. He succeeds Citibank’s Natasha Ansell who held the post in 2017, according to the report. His work will include liaising with colleagues at the AmCham branch in Ho Chi Minh City, the southern metropolitan area nearest to Ho Tram. The news report said Mr Kelly looked forward to working with AmCham members to further economic, social, and business ties between Vietnam and the United States. Currently under Vietnamese law, the casino at the first phase of the Ho Tram resort complex is only allowed to serve foreign players. But the scheme hopes to be part of a pilot project under which locals will be allowed to gamble in Vietnamese casinos. Mr Kelly is executive chairman and chief executive of Ho Tram’s backer, Asian Coast Development Ltd and its wholly-owned subsidiary Ho Tram Project Co Ltd. He joined Asian Coast Development in September 2015, and has more than 30 years of senior management experience running gaming firms. The Ho Tram Strip plot in Ba Ria-Vung Tau province, is 120 kilometres (75 miles) southeast of Ho Chi Minh City. Augustine Ha Ton Vinh, an academic who says he has been advising the Vietnamese government on liberalising the country’s gaming industry, told a panel at the MGS Entertainment Show in November that two Vietnam properties would be in the first wave of gambling for locals. He said they were a casino resort at Van Don in northern Vietnam, and one on Phu Quoc Island in the south; with two more – in Ho Tram and at Hoi An – “in limbo”.